Over the course of two days, thousands of children and parents came to FAO Schwarz to help lend a hand in building the biggest LEGO Batman in the world. More than just a "building" event, the project was designed to exite children about play and construction, teamwork, and the great results of working together. After helping, each child (and parent!) got a signed certificate of achievement and a free gift. More time was spent interacting with children than actually building. Sean would take the time to show kids how the portion they built would help create the large sculpture, how the sculpture was designed and how it will come together, and -- of course -- to commend them on a job well done. Towards the end of the second day, Sean gave children building puzzles to help create some of the more complicated pieces that would be used on the head. Excited kids rushed to build and think as fast as they could as Sean added them to the sculpture. 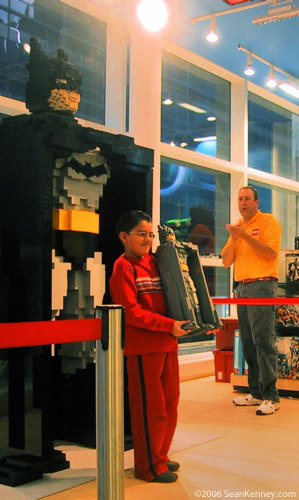 The event and the sculpture was designed by LEGO Master Builder Steve Gerling, who created a 2-foot tall Batman prototype that was re-built 4 times larger over the course of the two days. BATMAN is a trademark of and © DC comics.